Stocks have been the most robust component of the nation’s up-to-recently spotty recovery from the Great Recession. Broad indices such as the Dow Jones Industrial Average and the Standard & Poor’s 500 have long since surpassed their pre-crash highs. Even the technology-heavy Nasdaq composite, which plunged during the dot-com bust and remained depressed for years afterward, is close to the all-time high it set back in March 2000. 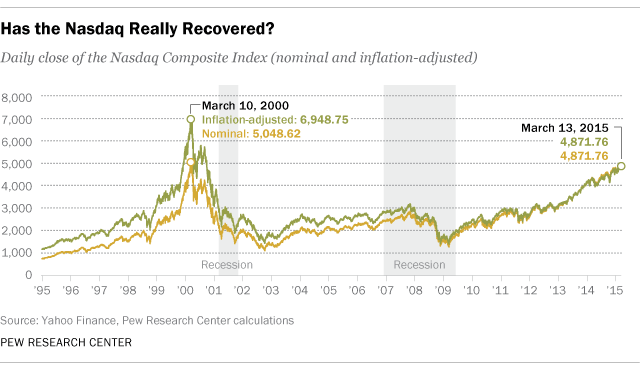 Small wonder, then, that 31% of Americans say the stock market has fully recovered from the recession, according to a recent Pew Research Center survey, and 47% say it has partially recovered. Overall, more Americans see full or partial recovery in stocks than in any other aspect of the economy we asked about (jobs, incomes, real estate). Stock ownership (both direct and indirect, through retirement accounts and mutual funds) is heavily concentrated among wealthier households, and many Americans haven’t benefited from the rising markets. But according to our analysis, even stockholders haven’t benefited as much as their account statements might indicate. Stock prices and index values seldom are adjusted for inflation, which means investors and observers may have an exaggerated sense of the stock market’s real-world performance. But over time, the effects of inflation can be considerable: Over the past two decades, for example, the Nasdaq composite index is up 555% on a nominal basis, but “just” 320% after adjusting for inflation. Since most Americans who own stock do so inside retirement accounts (49.2% of families have such accounts, while just 13.8% own stocks directly, according to the Federal Reserve’s 2013 Survey of Consumer Finances), they’re presumptively long-term investors for whom inflation ought to be a consideration.